W. K. Clifford (1845-1879) was a noted mathematician and popularizer of science in the Victorian era. Although he made major contributions in the field of geometry, he is perhaps best known for a short essay he wrote in 1876, entitled "e;The Ethics of Belief"e;, in which he argued that "e;It is wrong always, everywhere, and for any one, to believe anything upon insufficient evidence.&q… uote; Delivered initially as an address to the august Metaphysical Society (whose members included such luminaries as Alfred Lord Tennyson, William Gladstone, T. H. Huxley, and assorted scientists, clerics and philosophers of differing metaphysical views, "e;The Ethics of Belief"e; became a rallying cry for freethinkers and a bone of contention for religious apologists. It continues to be discussed today as an exemplar of what is called 'evidentialism', a key point in current philosophy of religion debates over justification of knowledge claims.In this book, Timothy J. Madigan examines the continuing relevance of "e;The Ethics of Belief"e; to epistemological and ethical concerns. He places the essay within the historical context, especially the so-called 'Victorian Crisis of Faith' of which Clifford was a key player. Clifford's own life and interests are dealt with as well, along with the responses to his essay by his contemporaries, the most famous of which was William James's "e;The Will to Believe. 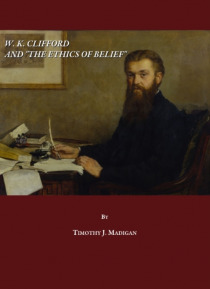 "e; Madigan provides an overview of modern-day critics of Cliffordian evidentialism, as well as examining thinkers who were positively influenced by him, including Bertrand Russell, who was perhaps Clifford's most influential successor as an advocate of intellectual honesty.The book ends with a defense of "e;The Ethics of Belief"e; from a virtue-theory approach, and argues that Clifford utilizes an "e;as-if"e; methodology to encourage intellectual inquiry and communal truth-seeking.' The Ethics of Belief' continues to provoke and stimulate controversy, which was perhaps Clifford's own fondest hope, although he had no right to believe it would do so.